We have the facilities to produce your finished product, including connections to sub-contractors for painting, plating and heat treatments. 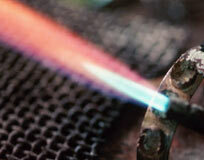 All welding machines are on site and are calibrated every twelve months. Personnel are tested every two years to BS EN 287-1 1992 standard by an independent BS approved inspector, as well as an 'in house' assessment every six months. Mig and Tig welding is performed by coded welders in all types of ferrous and non - ferrous materials. The items produced range from steering columns for motor vehicles to simple bracketry with batch sizes of 200 - 5,000. Spot welding is confined mostly to ferrous materials although non-ferrous materials can be accommodated. Items produced range from projection welding of studs through to complicated multi component fabrications in batch quantities of 200 - 5,000. Paint, Plating & Heat Treatments are subcontracted processes which can be completed to your specifications.